The technology that’s making everyday objects smarter, from thermostats to excavating machines, is also improving construction site security. With the advent of the Internet of Things (IoT), smart technology systems are reducing losses from theft and vandalism. Smart technology is making construction site security better. The IoT connects devices through the internet for remote monitoring and control. This smart technology is available in security systems that allow project managers to remotely view live footage from wireless devices like smartphones. We spoke with Jesus Medina about the future of smart technology and construction site security. He said the future holds deeper connectivity in smart technology. Some of those technologies are already in play here at ECAMSECURE, such as mobile surveillance units, while others are in the experimental phase. We’ve used drones for aerial mapping and are exploring how the technology fits into remote monitoring. We’re also exploring audio analytics and aggression detection, which can detect sounds such as glass breaking, car alarms, gunshots and even tone of voice. Today, off-site construction site security monitoring services are perfect examples of the IoT in action. 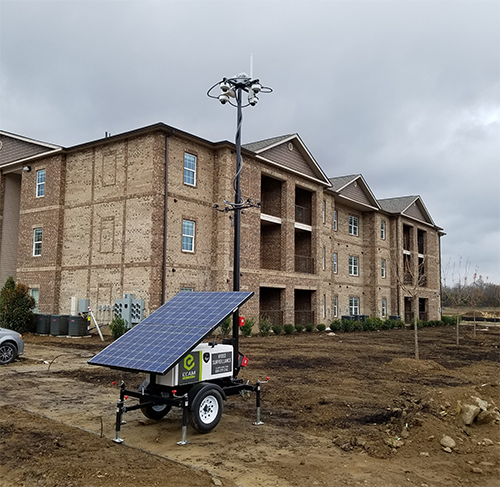 Mobile Surveillance Units (MSUs) are connected via cell service or a landline to a central monitoring station to provide real-time oversight of a construction site. If the night-vision cameras detect motion, the system sends an alert to the monitoring station, which can be forwarded to the site supervisor. Depending on the security environment, two-way audio can be deployed to allow whoever is monitoring the situation to speak directly to the unauthorized intruders who have entered the site. Thanks to rapidly improving internet bandwidth capabilities, video verification of alarms takes just a split second. That means police can respond more quickly to a verified emergency situation. GPS-enabled tags are used not only to mitigate losses from theft, but also to manage inventory and track locations of equipment. Those same tags can be tied to the security system to monitor if equipment leaves the site after hours or is moved to an out-of-the-way location to be picked up later. In addition to theft prevention, smart sensor technology can reduce damage. Flood detection devices can send an alert when water pressure reaches a pre-set level. If the pressure drops drastically, there’s a high probability that the pipe has been breached. With rapid response, the damage can be mitigated quickly. These systems might be used on pipeline projects and high-rise residential projects to protect the water main during construction. The downside of IoT technology, Jesus says, is that it depends on the internet, so when the internet goes down, you have to have a backup plan. ECAMSECURE uses redundant services so that if the live feed is interrupted by poor internet service during a storm, for example, the unit itself is recording activity. In 2016, the National Insurance Crime Bureau (NICB) and National Equipment Register (NER), estimated the total value of construction and farm equipment stolen in the United States was approximately $300 million. The report also states that equipment produced in the last 10 years accounted for 75% of thefts reported to the National Crime Information Center (NCIC). The newer the equipment, the more attractive it is to thieves. Cameras can use thermal imaging to detect temperature increases before a fire breaks out. That means if a piece of equipment is running hot, or some debris is smoldering, the thermal imaging system will detect that the temperature is above a pre-set level and send an alert. The potential fire can be snuffed out before it spreads. License plate recognition tracks the entrance and exit of vehicles in and out of sites for security purposes. Access control can be a part of that system, with only approved vehicles allowed to enter. Incident response can also be improved with license plate recognition being used as part of investigations into unauthorized access. With sophisticated recognition technology, security systems can detect potentially dangerous events by picking up on specific sounds, such as glass breakage, gunshots and even aggressive language from people on site. Drones, or unmanned aerial vehicles (UAVs), add another layer of mobility and interactivity to security. Drones allow surveillance systems to capture footage where ground units and physical security guards can’t see or reach. 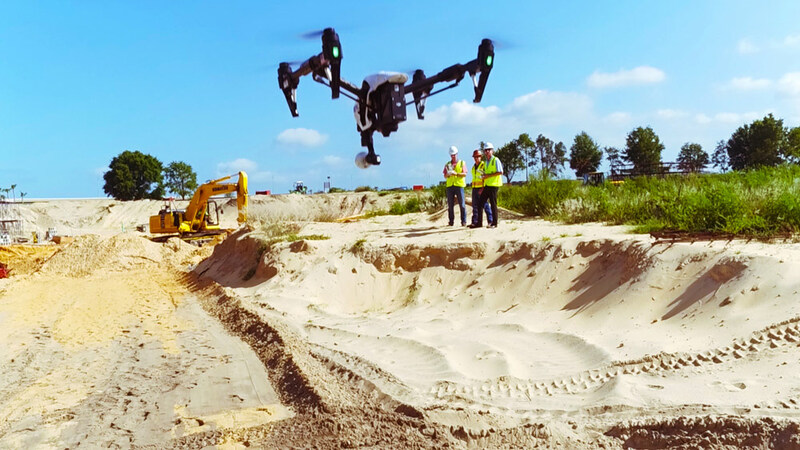 Drones can also be used to assess the quality of security for construction sites. An example of this is using a drone to survey perimeter fencing to look for gaps. 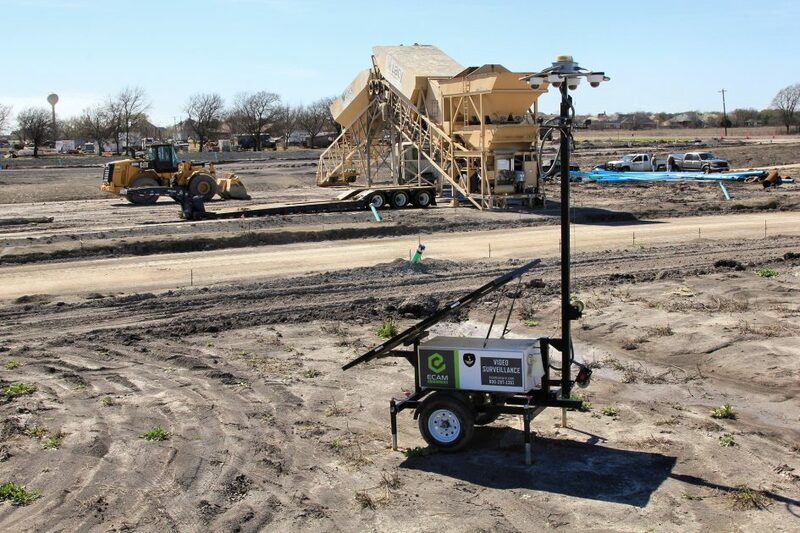 Smart technology systems for construction sites make it possible for us to watch over a construction site at all times from any internet-connected device. As technology develops, you’ll have greater control over what’s happening at your job site, enabling you and your construction site security teams to protect and manage valuable construction assets.